Scott's Bots Robot Controller Kit. This controller kit has everything you need for Pic development. Whether you just want to build a simple robot like the 10 Minute Robot, or something more sophisitcated like CRaB or Jr2, this is all you need to get started. 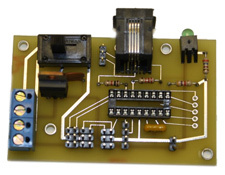 The perfect way to power your Servo Controller (SSC) or just a simple DC-DC Converter. This DC-DC Converter is designed to convert 12VDC to two outputs, one at 6VDC, and the other at 9VDC. However you can configure it with any combination you like up to 60 watts. A distribution board designed to convert .100" header pins, to something more robot friendly RJ11 Connectors. 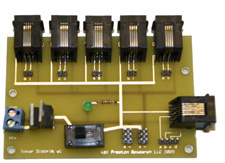 This distribution board not only converts .100" connectors from your breakout boards, but it also powers your external sensors with a regulated 5VDC (or other voltage by swaping out the regulator). Carrier Board for the Devantech CMPS03 Digital Compass. This carrier board allows for simple connectivity to a RJ11 connector. The RJ11 connector has 2 ports for I/O and 2 for power. There's is even a jumper port that allows you to calibrate the compass. (Not shown with header pins/). Compass not included.